The Care to Share Program – Referrals! Converting consumer calls into scheduled appointments. Getting the consumer to accept your service (treatment plan acceptance). Having an internal marketing campaign that generates more referrals. Having a system of reactivating the consumer to come back for further service (recall and old patients who didn’t complete their treatment plan). 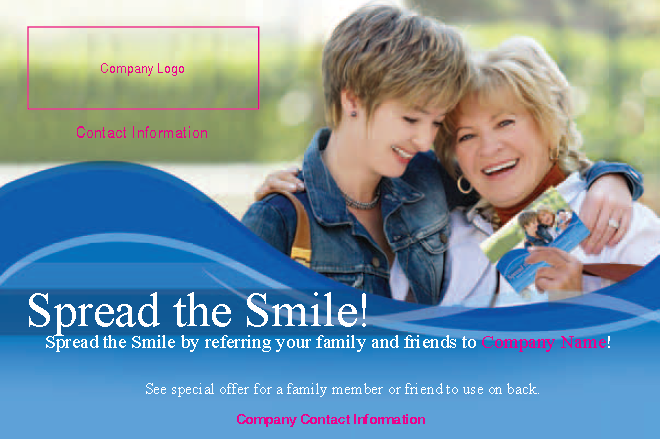 The factor we address FIRST is generating NEW PATIENTS through an internal marketing campaign! We call it The Care to Share Program. 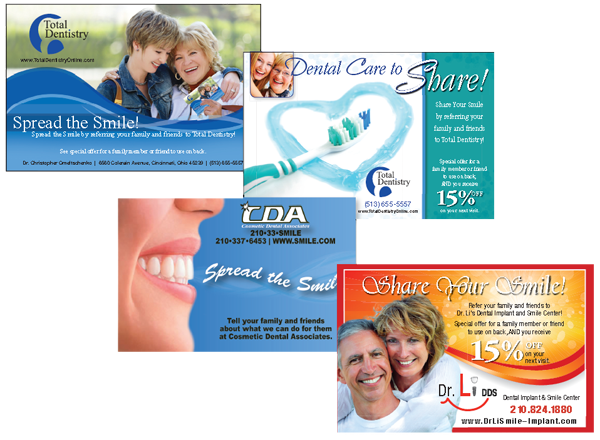 The concept of the Care to Share cards is to help encourage and reinforce referrals as the most successful source of new patients. Referrals come from existing patients who are happy with their services who then tell other family members, friends or associates at work about your great service. The Care to Share cards are not mailed. They are handed out to existing patients as they roll through while receiving their own service. They can be given out at reception when people come in or are waiting. They should definitely be handed out by whoever checks the person out when they are done with services. They should also be given to all of your staff to give out to friends and family members. And they can be used for cross referrals between professionals. The card has a special offer on the back for the person they refer. It can be an exam special offer or it could be a free consultation if you would prefer that. It also rewards the person for referring someone to you by giving them a credit toward their next service. This can be a percentage such as 15% off their next service or a dollar amount, like $50. Referrals is a major source of new patients. It is worth the investment. Since you are not mailing these out, this will give you promotion that will last months that will cost a fraction of what you are paying for other advertising. It’s the cheapest possible promotion you could do to get new patients. We have done this many times in other offices very successfully. It is a winning program. Below are some samples of some of the gorgeous Care to Share cards that were designed for other clients. You will get a unique design for your practice or business and a special offer that fits and is appropriate to introduce your services. It is THE BEST marketing ROI you will ever get on any promotional program! !